Max is No. 15 and Monty is No. 16. These twin dump trucks think they know everything about construction, and cause havoc by their reckless nature. They like to bully the smaller machines in the yard, but eventually they always get their comeuppance. 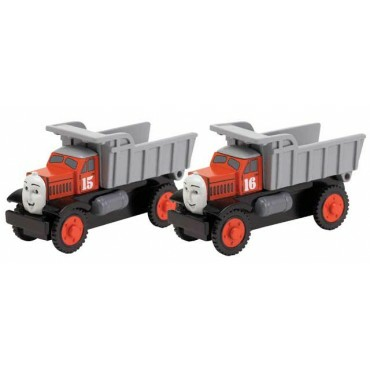 As seen in "On Site With Thomas" and "Thomas' Trusty Friends" videos. Designed to work on and off track. Slide fuel tank to lift truck bed.